1995-01-13 First worldwide family litigation filed litigation Critical https://patents.darts-ip.com/?family=20369573&utm_source=google_patent&utm_medium=platform_link&utm_campaign=public_patent_search&patent=EP0307625(A2) "Global patent litigation dataset” by Darts-ip is licensed under a Creative Commons Attribution 4.0 International License. An optical gas analyzer comprising a source of radiation (1) and means (8) for conducting the radiation obtained from this source (1) through a gas sample and a number of optical filters (10a,10b,10c) corresponding to the number of gases analysed, each of which allows through a wavelength representa­tive for the particular gas and especially absorbed by the same, to a number of detector (11a,11b,11c) corresponding to the number of gases analyzed. The gas analyzer described is intended primarily for the measurement of anaesthesia gases, e g halothane, isoflurane and enflurane, carbon dioxide and laughing gas and in particular in connection with anaesthization for monitoring the patient and administering the anaesthetic. The gas analyzer is characterized by means (8a,8b,8c) for the dividing up of the radiation path after passing of the gas sample for the purpose of simultaneous measurement of the gas concentrations in respective detectors. The present invention relates to an optical gas analyzer comprising a source of radiation and means for conducting the radiation obtained from this source through a gas sample and through a number of optical filters corresponding to the number of gases analyzed, each of which allows through a wavelength representative for the particular gas and especially absorbed by the gases analysed. Gas analyzers in accordance with the invention are in­tended primarily for the measurement of anaesthesia gases, e g halothane, isoflurane and enflurane, carbon dioxide and laughing gas and in particular in connection with anaesthization for monitoring the patient and administering the anaesthetic. a) Mass spectrometers are expensive (> 300 kkr) but quick, they measure all gases and produce relatively good accuracy. They require qualified operators. b) Raman spectrometers are also expensive (100-200 kkr). They are new in this application. Quickness, accuracy and stability have not yet been documented. They presumably require qualified operators. c) IR-based instruments are the most common. They are relatively cheap, stable and do not require qualified operators. The accuracy depends on the design. For carbon dioxide and laughing gas the instruments on the market today are sufficiently quick for endtidal measurements, but up to now the instrument has been to slow for anaesthesia gases. d) Instruments based on quartz crystals are very cheap. They exist only for anaesthesia gases. They are quick, but unfortun­ately unstable and have a short life. They have limited accuracy because, i a., of the influence of e g laughing gas and water vapour. A measuring system based on infrared rests on the prin­ciple that the substance to be analysed absorbs IR-radiation of wavelengths which are unique of the substance in question. IR-radiation is generated by a source of radiation which emits continuously radiation over a large wavelength range. With the help of e g an optical filter the correct wavelength is chosen and the radiation is detected by an IR-detector which transduces the incident radiation energy to a proportional electrical signal. The choice of the analytical wavelength for a substance is very critical and wholly decisive for system characteristics such as accuray and quickness. In practice the choice is govern­ed by whether several of the substances present absorb at or near the wavelength chosen, and whether it is technically/­economically possible to measure radiation of this wavelenght to the specified accuracy requirement. Today the existing IR instruments for carbon dioxide and laughing gas have been optimized to such a degree, that any improvements concerning performance for these substances are hardly possible. For anaesthesia gases the position is different. The absence of suitable commercial IR-detectors has had the result that IR instruments for these gases have been forced to operate with short wavelengths, where the gases have very low absorp­tion. This has meant instruments which need large sample volumes and which, therefore, will be slow. Measurements, moreover, have been disturbed by water vapour in the gases analysed. For a few years now, however, detectors have been on the market which allow measurement at longer wavelengths, where the gases are absorbing much more strongly. An instrument which makes use of these wavelengths therefore requires a very small sample volume and consequently can be quick. For end-tidal measurement the measuring system in some manner has to receive information indicating when the expiratory phase approaches the end. This information can be obtained through measurement of the carbon dioxide content, and in­struments which measure the end-tidal carbon dioxide contents have been known for a long time (capnometers, capnographs). On passage through the carbon dioxide meter, however, the sample gas will get mixed up and an anaesthesia gasmeter coupled in series will receive a phase-displaced and distorted sample, that is to say any curves recorded will receive a profile distortion. The invention thus relates to an optical gas analyzer comprising a source of radiation and means for conducting the radiation obtained from this source thorugh a gas sample and through a number of optical filters corresponding to the number of gases analysed, each of which allows through a wavelength representative for the particular gas and especially absorbed by the same to a number of detectors corresponding to the number of detectors corresponding to the number of gases analysed. More particularly, the gas analyzer in accordance with the invention is characterized by means for the dividing up of the radiation path after passing of the gas sample for the purpose of simultaneous measurement of the gas concentration in respect­ive detectors. The gas analyzer in accordance with the invention is intended in particular for the measurement of, among other things, anaesthesia gases in the inspired and/or expired air of a patient. The said optical filters are chosen so, therefore, that they allow through wavelengths only between 3,8-5µ and 8-14µ, that is to say neither higher, nor lower, nor any wavelengths in between. In this way the moisture in the breathing air is prevented from affecting the respective measuring result, since water vapour has substantial absorption regions within the regions excluded. On measuring anaesthesia gases, e g halothane, isoflurane and enflurane preferably a filter is selected which is permeable for wavelengths 8,81µ, in combination with an N₂O filter and a CO₂ filter which are premeable for wavelenghts especially absorbed by these gases, preferably 3,90µ and 4,26µ respect­ively. 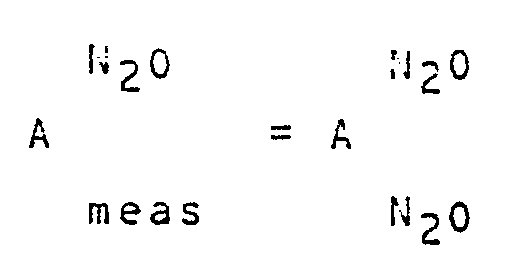 However, the N₂O content here may affect the measuring result for the anaestesia gases and for this reason suitable means are provided for correction of the absorption caused by N₂O recorded by the anaesthesia detector as a function of the measured value obtained at the same time in the N₂O detector. The said means for the division of the radiation path consists apropriately of a mirror arrangement which preferably divides the radiation path into a number of equivalent ray bundles corresponding to the number of gases analysed. It will be obvious, however, to those versed in the art that other arrangements too may be used, e g collective optical lenses, provided these allow through the wavelengths selected. In a practical embodiment of the subject of the invention the gas analysed is passed through a cell or the like with two windows of, for example, CaF₂ (calcium fluoride) transparent for the radiation, placed in the radiation path. As further exmples of suitable material might be mentioned BaF₂ (barium fluoride), CdTe (cadmium telluride), Ge (germanium) and ZnS (zinc sulphide -Itran II). Preferably means are provided for keeping constant the temperature of the items, e g filters, mirrors, lenses and detectors together with holders for these items, situated in the radiation path. At the same time the keeping constant of the temperature in the gas analysed is aimed at, this temperature being above the dew point of any water vapour present therein. In a preferred embodiment of the gas analyzer according to the invention the same is provided with means for the continuous conducting of the gas mixture analysed through the radiation path and with means, e g a rotating diaphragm, for the regular interruption of the radiation path so as to obtain intermittent meauring values. In monitoring a patient during anaeshetic treatment it is endeavoured to determine the end-tidal measuring value of the respective gases. For this reason the gas analyzer in accordance with the invention is provided appropriately with means for utilizing the measuring values obtained in the CO₂ detector for the determination of the end of the repective expiratory phase. For example, microcomputers included in the analyzer can be programmed so that they indicate the end of each expiratory phase. The source of radiation appropriately consists of an IR-source which emits a continous radiation over a large wave­length range, e g a thermal lamp with an envelope of quartz glass which absorbs the thermal radiation from the incandescent filament and in this way is heated so that it in turn gives off the desired radiation. This radiation can be amplified within the desired wavelength range, if the heat source outermost is surrounded by a thin metal envelope with oxidized outer surface, e g an envelope of steel or brass, preferably black-nickel-­plated brass. Fig 1 shows schematically the radiation path in a gas analyzer in accordance with the present invention. Fig 2 shows in a little more detail, but still schematic­ally, a gas analyzer in accordance with the invention. 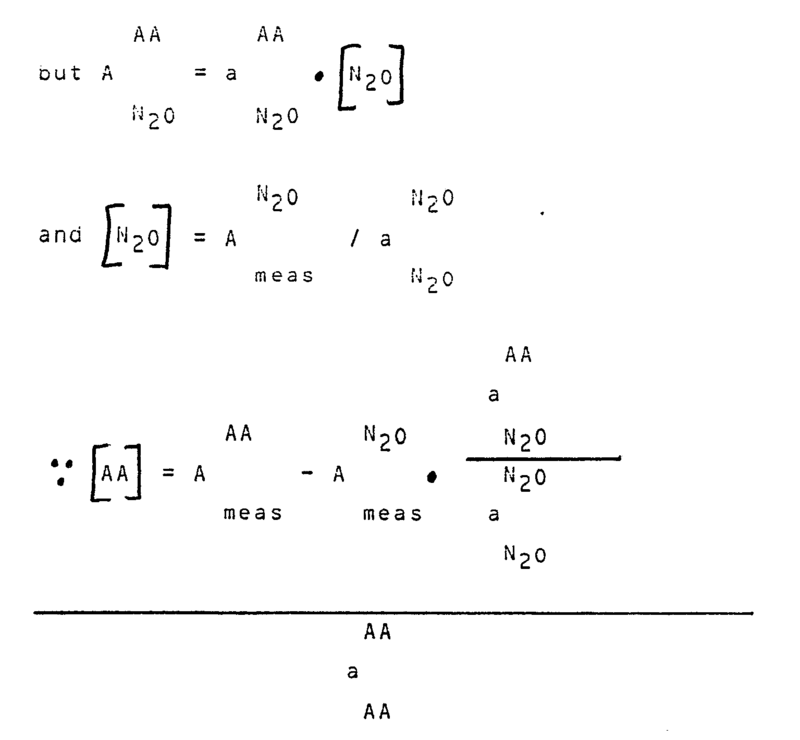 Fig 3 shows the absorption curves for N₂O and for the aforementioned anaesthesia gases and the transmission curves for the filters used for the respective gases in accordance with the invention. Figure 1 thus shows a schematic illustration of the radiaion path in a gas analyzer according to the invention. On the left is shown a cylindrical light source 1, which, for example, may consist of a heated body. The radiation from the source passes a rotating diaphragm 2 which chops it up in time (on account of the detection principle). Thereafter the radia­tion passes a conically shaped cell 3 which is delimited by two windows 4 and 5 which are transparent for the actual radiation. For reasons of clarity the window 4 is shown separate from the rest of the cell. Numeral 6 refers to the inlet for the gas mixture examined and 7 to the outlet for the same. From the cell 3 the radiation is conducted further to a three-part mirror 8 which divides up the original ray bundle 9 into three part bundles 9a, 9b and 9c respectively to be direct­ed through three filters 10a, 10b and 10c respectively and further from these to three detectors 11a, 11b and 11c respect­ively. When the gas analyzer shown is used for the measuring of anaesthesia gases, the detector 11a is constituted preferably of a CO₂ detector, the filter 10a being of the kind which allows through the wavelength 4,26µ representative for CO₂. In the same way the detector 11b at the same time may be constitued of an N₂O detector, the filter 10b being selected to allow through a wavelength representative for the same, e g 3,90µ. The detector 11c finally is used for the actual measurement of the anae­sthesia gas used. The filter 10c in such a case is chosen so that it allows through a wavelength representative for this, e g 8,81µ. In fig 1, for the sake of clarity, the different filters and detectors have been shown as separate units. Appropriately they are built together instead into three units, that is to say one unit for each wavelength. Each part of mirror 8a, 8b and 8c respectively is designed as a segment of a circle of 120°. The parts of mirror, moreover, have an "off-axis" placing in relation to the cuvette, whose windows therefore will be pictured three times on a periphery of a circle. In this manner the radiation can be conducted easily via the respective filter to the respective detector for simult­aneously reading of the respective amounts of gas. For carbon dioxide there exists only one practically usable wavelength, namely 4,26µ. For N₂O, that is to say laughing gas, there are several. For technical reasons the wavelength 3,90µ preferably is used here. For the three anae­sthesia gases a great number of wavelengths exist, which may be used in principle. To avoid interference from water vapour, and to make possible a test volume which is as small as possible, the appropriate wavelength is 8,81µ. This wavelength, moreover, has the advantage that it can be used for the analysis of all the abovementioned three anaesthesia gases, which renders the design much less expensive. The analysis is slightly disturbed, though, by laughing gas, so that the same has to be measured separately for compensation. How this compensation is done will be described in more detail in the following. The laughing gas content is also of direct clinical interest. Until a few years ago measurements at wavelengths over 5µ were practically impossible in this type of instrument owing to the non-existence of suitable detectors. The coming into being of pyroelectric detectors has altered the situation and made possible measurement also at wavelengths where anaesthesia gases strongly absorb the radiation. In order to measure at three wavelenghts the radiation, which passes the cell comprising the gas sample, thus has to be divided over three filter/detector systems. A distinction may be made here between division in time and in space. In accordance with the invention spatial division is used, and the three parts of mirror each forward their part of the total radiation to the respective detector. The parts of mirror also fulfil the task of collecting the radiation from the IR source over a large solid angle. Since pyroelectric detectors create quite a lot of noise, they call for plenty of signal. This is particularly important in the rapid detection which is needed for end-tidal measurements. The amount of radiation which strikes the detector is directly proportional to the solid angle under which the detector "sees" the light source, or the angle under which the mirror collects the radiation. The three parts of the mirror are functionally separate units but may be manufactured as one component e g by casting or compression moulding in plastics, diamond turning in aluminium or pressing of glass. As a source of radiation preferably a hot-body radiator is used which may consist of an ordinary 12V/20W halogen bulb run at approx. 12W. The envelope of the bulb may consist of quartz glass which absorbs all IR radiation from the incandescent wire and is heated. The envelope in turn gives off radiation of longer wavelengths according to Planck's radiation law. It is thus the hot glass envelope which constitutes the actual source. This source is used today in this form in a CO₂ analyzer sold by the applicant under the name of ELIZA. Unfortunately, though, quartz has a relatively low coefficient of emission at the particular wavelengths and the source, therefore, is wholly ineffective at, for example, a wavelength of 8,8µ. Certain metal oxides, however, are known to have high coefficients of emission in infrared. The efficiency of the source can be raised, therefore, if the quartz envelope is surrounded by a thin metal envelope whose surface has been oxidized. This envelope may be constituted of a tube with a wall thickness of 0,5 mm which has been oxidized either in a flame or chemically. Successful experiments have been carried out with brass and stainless steel which both increased the radiation efficiency 2,5-2,7 times at 8,8µ and approx. 1,5 times at 4,25µ. Corre­sponding improvements and even better results ought to be obtainable with black-nickel-plated brass. In fig 3 is shown a schematic sketch illustrating how laughing gas (N₂O) disturbs the analysis of anaesthesia gas (AA) if this consists of, for example, halothane, isoflurane and enflurane. The filter which is used to isolate the wavelength range where the AA absorb, unfortunately allows through a small part of one of the ranges where N₂O absorbs. A change in the NO₂ content therefore will affect the transmission through the filter and be interpreted as a change in the AA content, and thus has to be corrected. 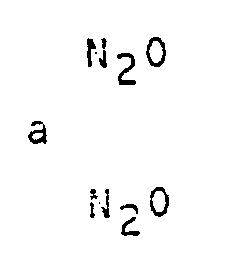 1) The N₂O content is known, owing to simultaneous mea­surement in the N₂O detector. 2) The effect of N₂O on the AA-measurement can be quanti­tatively determined by means, for example, of calibration with a gas mixture of known N₂O content. The following is a technical description of how the compensation proceeds. For the sake of simplicity a linear connection has been assumed here between the magnitudes of the absorbent and of the concentration. In fig 2 is shown in a little more detail, but still schematically, a practical embodiment of the subject of the invention. For corresponding parts the same reference designa­tions have been used here as in fig 1. The light source used thus has been designated 1 and a rotating diaphragm 2. In the same way the cell is designated 3 and its two windows 4 and 5 respectively. The gas mixture analysed is introduced via the inlet 6 and discharged via the outlet marked as a point 7. The mirror used has been designated 8 and it comprises parts 8a,8b and 8c. The radiation path has been marked only for the mirror part 8c which directs its part of the radiation to the detector 11c via the filter 10c. The cell, the mirror, the filter and the detectors are arranged in a rigid envelope 12 comprising, among other things, a distance tube 13 to make possible, among other things, the keeping constant of the temperature and a firm exact position of the particular item. Around the distance tube 13 has been wound a thin heating foil 14a. This heats on the one hand the distance tube 13 and the items enclosed therein, on the other hand a pipeline 14 wound outside the foil for the gas examined, which is thus also heated to a suitable temperature. Numeral 15 designates the motor for the rotating diaphragm 2 and 16 a cooling flange. Numeral 17 designates a protection for the diaphragm 2 and 18 a circuit board indicated symbolically which is connected to an amplifier 19. The circuit board 18 comprises, or is connected to, a microcomputer not shown for the control of the desired measuring process. Numeral 20 finally designates a holder for the heat source 1, e g a standard ceramic holder. A pressure gauge arranged in the measuring cell, finally, is marked 21. The invention is not limited solely to the embodiments described above, but may be varied within the scope of the following claims. For example, the form and design of the individual parts may be varied within wide limits. 1. An optical gas analyzer comprising a source of radia­tion (1) and means (8) for conducting the radiation obtained from this source through a gas sample and a number of optical filters (10a,10b,10c) corresponding to the number of gases analysed, each of which allows through a wavelength representa­tive for the particular gas and especially absorbed by the same, to a number of detectors (11a,11b,11c) corresponding to the number of gases analysed, characterized by means (8a,8b,8c) for the dividing up of the radiation path after passing of the gas sample for the purpose of simultaneous measurement of the gas concentrations in respecive detectors. 2. A gas analyzer in accordance with claim 1, intended for measuring of, among other things, anaesthesia gases in inspired and/or expired air of a patient, characterized in that the said optical filters (10a,10b,10c) are chosen so that they allow through wavelengths only between 3,8-5µ and 8-14µ, as a result of which the moisture in the breathing gas is prevented from affecting the respectice measuring result. 3. A gas analyzer in accordance with claim 2, character­ized in that on measuring anaesthesia gases, e g halothane, isoflurane and enflurane, a filter (10c) is chosen which is permeable for the wavelength 8,81µ, in combination with an N₂O-filter (10b) and a CO₂-filter (10a) which are permeable for wavelengths absorbed especially by these gases, in particular 3,90µ and 4,26µ respectively. 4. 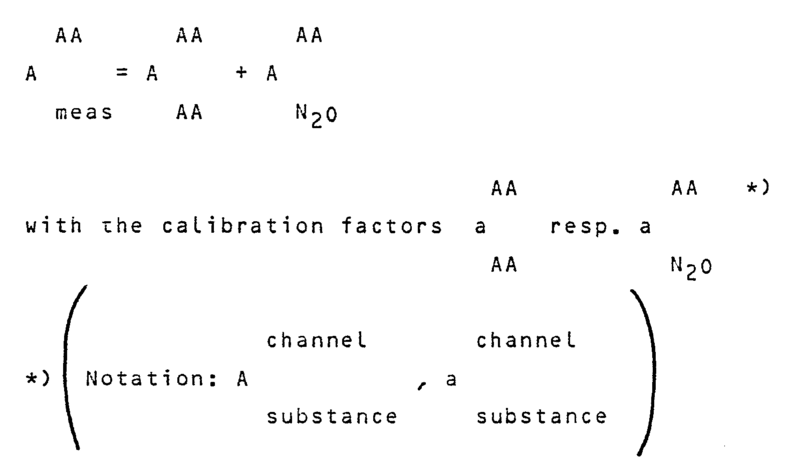 A gas analyzer in accordance with claim 3, character­ized by means (18) for the correction of the absorption caused by N₂O as recorded by the anaesthesia detector, as a function of the measured value in the N₂O detector (11b) obtained at the same time. 5. A gas analyzer in accordance with claim 1, character­ized in that the said means (8) for the division of the radia­tion path is constituted of a mirror arrangement which pre­ferably divides the radiation path into a number of preferably equivalent ray bundles corresponding to the number of gases analysed. 6. A gas analyzer in accordance with anyone of the pre­ceding claims, characterized by means for the conducting of the gas analysed through a cell or the like (3) with two windows (4,5) of for example CaF₂ (calcium fluoride) transparent for the radiation, placed in the radiation path. 7. A gas analyzer in accordance with anyone of the pre­ceding claims, characterized by means (14,18) for keeping constant the temperature of the items, e g filters, mirrors and detectors together with holders for these items arranged in the radiation path, and preferably also keeping the gas analysed at a constant temperature above the dew point of any water vapour present therein. 8. A gas analyzer in accordance with anyone of the pre­ceding claims, characterized by means (6,7) for the continuous conducting of the gas analysed through the radiation path and by means, e g a rotating diaphragm (2), for the regular inter­ruption of the radiation path in order to obtain intermittent measuring values. 9. A gas analyzer in accordance with anyone of the pre­ceding claims, characterized by means (18) for making use of measuring values obtained in a CO₂ detector for determining the end of an expiratory phase. 10. A gas analyzer in accordance with anyone of the preceding claims, characterized in that the source of radiation (1) consists of an IR-source which emits a continuous radiaton over a large wavelength range, e g thermal lamp with an envelope of quartz glass which absorbs the thermal radiation from the incandescent filament and in this way is heated so that it in turn gives off the desired radiation. 11. A gas analyzer in accordance with claim 10, character­ized in that the heat source is surrounded outermost by a thin metal envelope with oxidized outer surface. 12. A gas analyzer in accordance with claim 11, character­ized in that the metal envelope consist of steel or brass, preferably black-nickel-plated brass. 13. A gas analyzer in accordance with anyone of the preceding claims, characterized by a pressure gauge (21) ar­ranged in the analyzed gas sample. DE4214840A1 (en) * 1992-05-05 1993-11-11 Draegerwerk Ag Infrared absorption spectroscopy system or White cell for simultaneous analysis of constituents of fluid - provides wall of measurement cell with mirrors and interference filters behind which are located photodiode detectors. Owner name: ENGSTROM MEDICAL A.B.